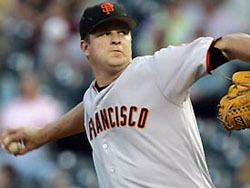 As I was recently watching a San Francisco Giants game, I made a double take watching Matt Cain pitch. It was as if I’d seen him before. Suddenly I realized where I’d seen Cain pitch before. Although he was only a young pitcher fresh from the farm, he pitched in a very important game many years ago. It was Cain who delivered the final pitch of the one-game playoff between the Pittsburgh Pirates and New York Knights in which the one-year wonder Roy Hobbs delivered a game-winning home run. 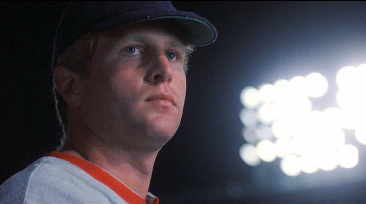 Taken moments before Matt Cain gave up the game-winning home run to Roy Hobbs of the New York Knights. Cain and the lights would be crushed. In terms of baseball, the 1991 World Series was the best ever played. Critics can turn to others and make a case based on TV viewership, large-market teams or national security, but when it comes down to the best possible baseball being played, 1991 runs away from the pack. 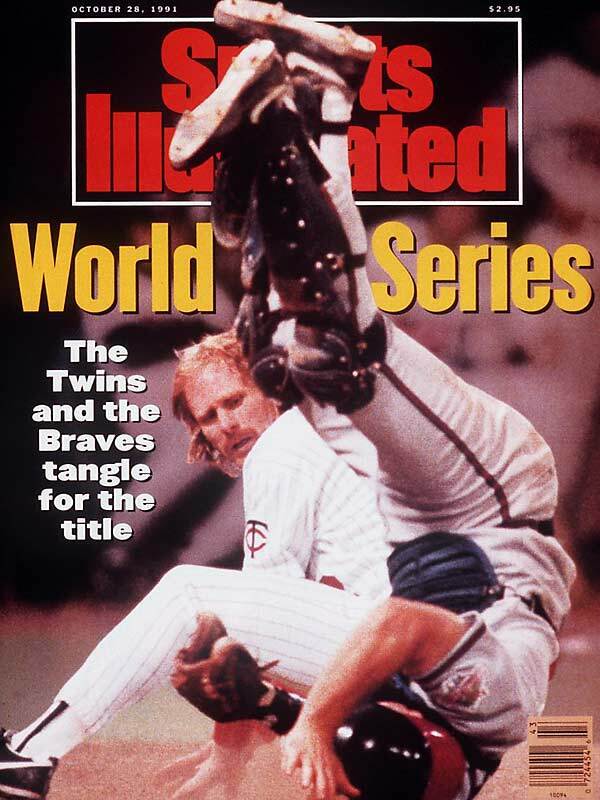 The main story behind that World Series was both teams, the Minnesota Twins and Atlanta Braves, were in last place in 1990. No team had ever come from last place to the World Series in one season and in 1991 two teams did it. Most people love an underdog and 1991 had two of them. Many point to 2001 as the greatest ever with 9/11 less than two months old and the New York Yankees at center stage. It’s true, it was a great World Series and one of the best. There were four games decided by one run, three in the final at bat and two that needed extra innings. Most of the nation, for once, was rooting for New York. In 1975 the Boston Red Sox looked as though they might end their championship drought against the Big Red Machine, Cincinnati Reds. This series contained five one-run games and two decided in the final at bat. Games 1, 3 and 7 contained comeback wins for the Reds while Game 6 remains one of the greatest World Series games ever with Bernie Carbo and Carlton Fisk carrying Boston to victory and keeping hope alive. The vastly talented Reds, however, won an exciting seventh game to win it all. In 1955 the Brooklyn Dodgers final beat the Yankees for their first and only title. The underdog Cardinals and Pete Alexander defeated the Yankees in 1926. The “bad guys” New York Mets won a thrilling sixth game at Shea Stadium to propel them to the 1986 championship. The Red Sox and New York Giants needed eight games (one ended in a tie) in 1912 to decide it all with the Red Sox winning one of the greatest final World Series games of all time (it’s certainly the best Game 8 of all time). Any World Series involving the Yankees or Red Sox tend to be over publicized. This isn’t to say 2001 and 1975 didn’t have great World Series, but they don’t match up to 1991 – here’s why. There is nothing more exciting than a walk-off win. The suspense is held and the game is decided in the final at bat and the home team and fans go home happy. This happened four times in 1991. Over half of the final seven games weren’t decided until the last batter of the game. All four of those games were decided by one run along with one other: five games decided by a single run. There was little room for error in the 1991 World Series. For the first time in World Series history, three games needed extra innings. The Minnesota Twins and Atlanta Braves were the most evenly matched teams in World Series history. The series started slow enough in Game 1. The Twins won 5-2 thanks to home runs from Chili Davis and Kent Hrbek. Jack Morris earned the win. Although it was a well played game, this would be the Twins’ most boring victory. The pitchers took over for the second game. The Twins’ Kevin Tapani and Cy Young winner Tom Glavine battled. With the game tied at two in the eighth inning, the Twins third baseman Scott Leius went deep off Glavine. Rick Aguilera struck out the side in the ninth for the save to preserve the 3-2 win. Gregg Olson took Dan Gladden's spiking at home plate with good sportsmanship. It was the third game were things started to get really exciting. Down two games to none, the Braves needed to win. The franchise hadn’t been in the World Series since the Milwaukee Braves in 1958 and had never been in the Series since its move to Atlanta in 1966. Down 4-1 in the seventh inning, the Twins stormed back to tie the game at four with a run in the seventh and two in the eighth. In the bottom of the 12th, with two out and David Justice on second, Mark Lemke stepped to the plate. Lemke was a .234 hitter that year, but had 10 hits in the Series and batted .417. His single scored Justice to give the Atlanta Braves their first World Series win ever. Jack Morris returned to the mound for the Twins in the fourth game. A 24-year old John Smoltz pitched for Atlanta. A 2-2 tie followed the Braves into the bottom of the ninth. The night before a .234 hitter was the hero. In Game Four, a .214 hitter with 16 plate appearances was the hero: Jerry Willard. With Lemke on third, Willard drove a shallow fly ball to Shane Mack in right field. The throw was on time, but Twins catcher Brian Harper could only get an elbow, not his glove, on the sliding Lemke. The Braves won 3-2 and evened the series at two games apiece. The fifth game was the anomaly for the 1991 World Series with Atlanta crushing Minnesota 14-5. This only set up the notion that the Braves might run away with the title in Minnesota. Atlanta had their two walk-off wins. Now it was Minnesota’s turn. In the first five games, Kirby Puckett was batting .167 (three-for-18). Puckett foreshadowed how his night would go in his first at bat with Chuck Knoblauch on first base. The centerfielder tripled down the left-field line to score Knoblauch and put the Twins on top. Both starters (Steve Avery and Scott Erickson) were taken out after six innings. Both bullpens proceeded to go into Operation Shutdown. It was Mike Stanton and Alejando Pena for the Braves and Carl Willis and Rick Aguilera for the Twins. Manager Bobby Cox decided to put left-handed junkballer Charlie Leibrandt on the mound to start the 11th inning with the score still tied 3-3. 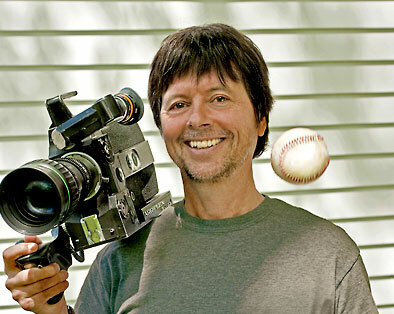 Puckett took three pitches and then launched a hanging changeup into the left-center field seats sending Minnesota into dome-controlled chaos. Another great aspect of the 1991 World Series worth noting was the sportsmanship shown by both teams to begin the final game. As Lonnie Smith stepped into the batter’s box for the first at bat, he stuck his hand out to Twins catcher Brian Harper and they shook hands. I still have never seen a gesture like than in professional baseball. Jack Morris and John Smoltz traded one scoreless inning after another. Neither team posed much of a threat until the eighth. 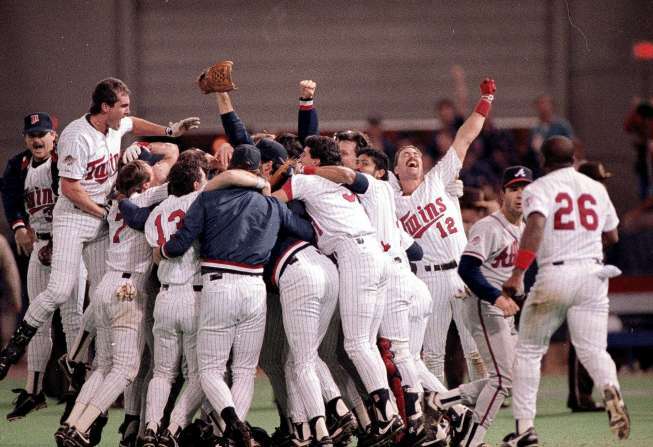 In the eighth inning of the 1991 World Series, every real fan of the Atlanta Braves and the Minnesota Twins lost five years of their life. The Braves had runners on second and third with no out in the top half. No one really knows why Lonnie Smith didn’t score from first on Terry Pendleton’s double, but there are theories. One is that Smith simply lost the ball as Dan Gladden and Puckett chased it against the left-center field wall. Another is Smith fell for shortstop Greg Gagne and second baseman Knoblauch’s decoy which made it appear they were fielding a double-play ball. My theory is a combination of the last two along with God and/or the baseball Gods wanted the Twins to win the World Series. Morris managed to get Ron Gant to ground out weakly to first base. Then, after walking David Justice, Sid Bream hit into a 3-2-3 double play to end the inning. The Twins had the bases loaded with one out in the bottom half before Kent Hrbek lined into an unassisted double play to the shortstop. Even in the ninth Minnesota started the inning with two singles before Mack hit into a double play and later Paul Sorrento struck out to strand a runner on third. And still, Jack Morris kept pitching. He pitched a scoreless ninth and 10th inning. In the bottom of the 10th inning, the Twins showed the world how baseball was played in Minnesota. Dan Gladden broke his bat on a bloop single to left-center field. His hustle stretched it to a double and the Twins thought they might see a light at the end of the tunnel. Knoblauch put down a sacrifice bunt and Gladden was on third with one out. The Braves walked Puckett and Hrbek to face … Jarvis Brown? No, but he was due up. Manager Tom Kelly put in of his best pinch hitters through the years: Gene Larkin. With the infield and outfield playing in, Larkin poked a single over the leftfielder’s head to send Gladden home to a waiting Morris. The starting pitcher had just thrown 10 shutout World Series innings and faces don’t get happier than Morris’s when Gladden touched home plate. There may be bigger names names in other World Series and others may be more historical. Names like Ruth, Mantle, Jackson, Jeter and Clemente come to mind when many fans think of the World Series. There was one hall of famer in the 1991 World Series (Puckett) and two or three others who hope to make it (Glavine, Smoltz and Morris). But the Series wasn’t defined by them. It was defined by great baseball games. If every World Series was compared to each other with a blindfold to the fan – not knowing what the teams, players, cities, fans or ballparks are – there was never a more evenly matched and enjoyable World Series than 1991. This celebration was part happiness and part tension release. First and foremost this postseason, I hope the Minnesota Twins win it all. If that can’t happen, all I ask for is some excitement in major league baseball’s postseason. It’s been a long time since there’s been some serious drama for the baseball playoffs. My definition of a great postseason is fairly simple: a lot of series-deciding games and underdog victories. I need plenty of division series that go to five games and championship series and World Series that reach the seventh game. By this definition, the last good postseason was 2003. In the last decade of postseason play, there have been 70 series: 40 division series, 20 championship series and 10 World Series. Only 27 percent (19) have gone to a deciding game. It’s up to you to determine if this number is low, but to me, it’s far too low. Why? Because it’s October and soon I’m not going to see competitive baseball for five lonely months and I want to see as much as possible before I spend 10 minutes every morning scraping ice off my windshield while dreaming of the warm breeze running through the upper deck of Target Field. World Series – 20% (two of 10). Only two World Series have reached a seventh game and they came in back-to-back seasons (2001 & 2002). This is the lowest total by decade since the 1930s, when there was also only two seventh games (the highest total was six, in the 1960s). This cannot stand. I realize a good seven-game series has a lot to due with luck and getting two very evenly matched teams against each other. There’s not much more to it than that. This blog is not about solutions or reasons why baseball hasn’t had a good postseason for a while. It’s pretty much just a baseball fan venting his frustration. Despite Minnesota’s first of four straight first-round exits in the 2003 playoffs, it proved to be a great October to watch baseball. In the division series the Cubs and Braves traded wins with Chicago taking the final game thanks to the pitching of Kerry Wood. The Oakland A’s took the first two games against the Red Sox, only to watch Boston win three straight to send them to the ALCS against the Yankees. The Marlins / Giants series proved exciting even if it was decided in four games with Florida winning the fourth game thanks to the heroics of Ivan Rodriguez. The last time there was a great postseason, Kerry Wood was a good pitcher for the Cubs. Then came the championship series. On paper they look exciting with both games going to a seventh game. In real life, they were more than exciting. At the time, I was rooting for the Red Sox and Cubs, as was most of the nation. The Red Sox hadn’t won their World Series they’d get the next year and spawn millions of bandwagon fans and the same can be said for Cubs fans … minus the World Series title, of course. Boston held a 5-2 lead of the seventh game entering the eighth inning. Some Red Sox fans will point fingers to manager Grady Little or Pedro Martinez, but I pointed straight up to Babe Ruth. It was the last year of the curse of the Bambino as he guided the Yankees to score three eighth-inning runs followed by an eleventh inning home run by Aaron Boone to take the Yankees to the World Series. On the north side of Chicago, there was also a curse involved, but this one hasn’t been broken yet and has much more to do with a poorly run organization and play. With the Cubs holding a 3-2 lead in the series and a 3-0 lead in the eighth inning, Moises Alou threw a conniption fit when he wasn’t able to make a catch on a foul ball in the stands which then caused shortstop Alex Gonzalez to drop an easy ground ball which then caused the Chicago Cubs to wet the bed and allow eight eighth-inning runs and lose 8-3. Wood was rocked in the seventh game and Florida won to take the NL pennant. The World Series didn’t go seven games, but when the Yankees are involved, I also root for a quick finish. 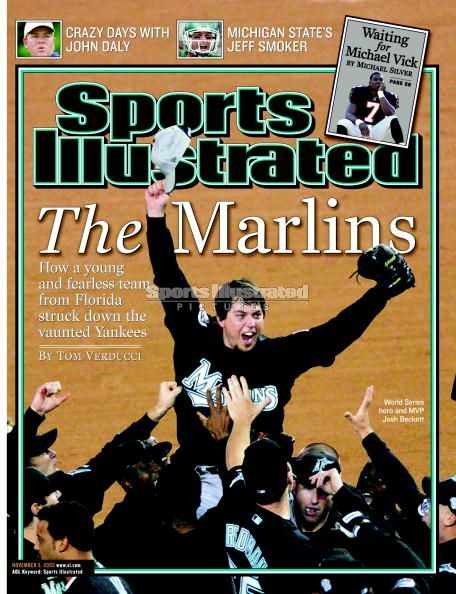 Josh Beckett shut down New York 2-0 in the sixth game, giving the Florida Marlins their second championship. That was a good World Series. The last great World Series was in 2002 when the Anaheim Angels defeated Barry Bonds and the San Francisco Giants four games to three. Seven years! It’s been seven years since baseball fans have seen a truly great World Series and six years since there has been a good amount of drama throughout the postseason. We’re due. What do I want from my postseason? I want John Smoltz versus Jack Morris-style pitching duels. I want underdog victories from the small-market teams as well as teams who haven’t been seen in the postseason for a long time. I feel like a James Bond villain as I say this, but I want the Yankees eliminated! I don’t want to see them in the championship series, let alone the World Series. The same can be said for the Philadelphia Phillies, but not to the same extent. I like the players on the Phillies, but they’ve been dominating the National League playoffs the last two seasons and I’d like to see someone new in the World Series. 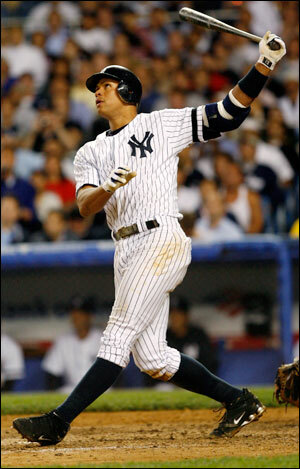 FOX Sports and Yankees fans are the only ones who would love to see A-Rod go deep in the postseason. There are some great story lines waiting to happen, but none of them include Mariano Rivera getting the last out in another World Series. No one thought the Reds would be better than the Cardinals, much less the rest of the division. The Giants lineup, with exception to rookie Buster Posey (great baseball name, by the way), is from the land of misfit toys. Baseball fans would like to remember Bobby Cox’s last postseason as a competitive one. No one believes in the Rays, especially in Tampa Bay. The Rangers have never won a postseason series. The Minnesota Twins are the greatest baseball organization in the history of mankind. There are so many good things that can happen this postseason. I’m hoping for all the baseball that’s possible. The postseason will consist of between 24 and 41 games. C’mon baseball, we won’t see you for a while … let’s make it last. The end of the last great postseason.